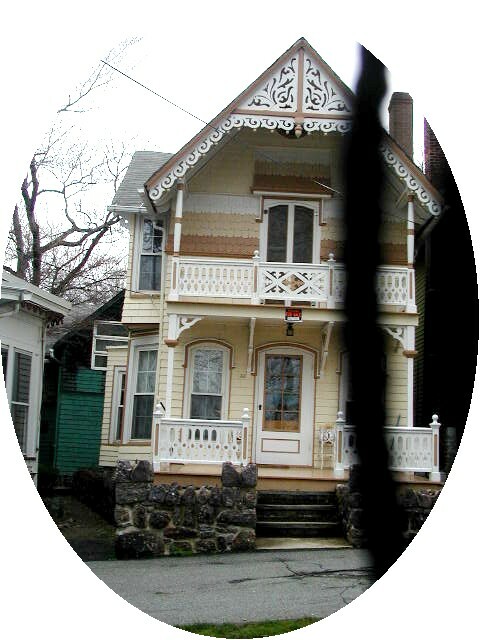 Although not much is known about the original appearance of this cottage, we do know that it started as a small, simple and unadorned residence and that the 1877 renovations included a bay window, architectural detailing, and “tasteful fence.” In 1882 readers were told that, “This residence has all modern improvements, including bathtub, lavatories, etc, with hot water attachments. The cottage is fitted with pipes and boiler and range, but to avoid the generation of heat, they have never been utilized.” The cottage is Eastern Stick Style with projecting gable roof and gingerbread trim. Note the combination of fish scale siding and clapboard which gives rhythm and character to the building. The arched 4/4 sash windows and arched double doors as well as the double door entrance to the balcony lend visual interest to the park facade. The house is little changed from its late 19th century appearance. Early photographs (pre-1900) of the house show simulated block siding with corner quoins and a shallower porch with decorative striped awnings. This cottage, and its neighbor number 35, were chosen by artist Lucille Hobbie in 1992 for portrayal in her “Historic Morris County” series of lithographs.